The Elmer Jared Bliss estate designed by Clough & Wardner c. 1904 in Chestnut Hill, Massachusetts. Bliss was founder of the Regal Shoe Company and held 87 patents related to shoe manufacturing. He was president, vice president or director at 27 other organizations including banks and insurance companies. It is unknown if the house is extant. I've never noticed a house that looks like this around Chestnut Hill, wonder if it is still standing? I assumed many of the homes in Massachusetts survived demolition. 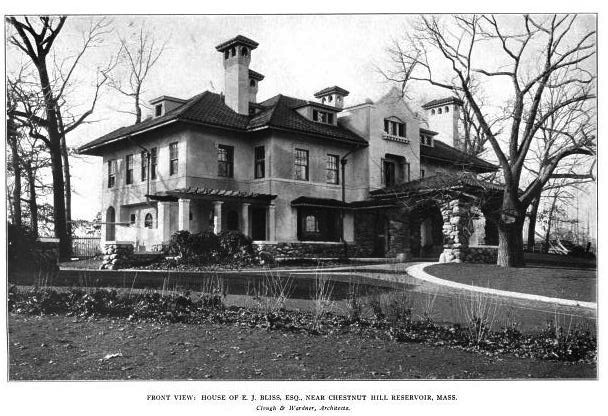 This house was built at 1962 Commonwealth Ave, in Brighton, very close to Chestnut Hill Reservoir. It does not appear to have survived. However, near 1954 Comm Ave, a different, smaller house still stands. 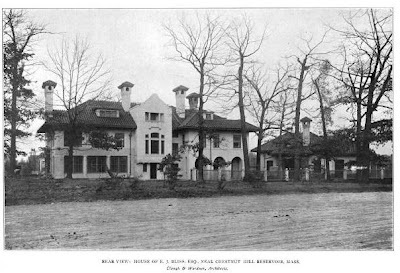 It looks like it could have been built around the same time as the Bliss house shown above.